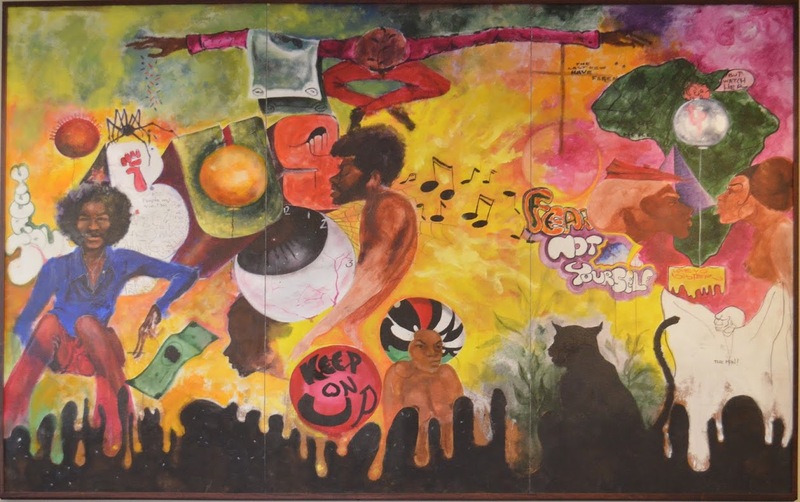 Mural by Ernie Pryor, Oscar Ritchie Hall, Kent State University. Courtesy WikiMedia Commons. The controversies over these and related incidents inspired a national debate about the teaching of history at the moment of an exceedingly vituperative political season, on the one hand, and corporate-style educational models, on the other. Perhaps most intriguing, this debate highlights the complicated and conflicted interests of large multinational textbook corporations, parents, students, and political ideologues in a fight for hearts, minds, and money in an expansive educational market. Once upon a time, in February, my son was conscripted to participate in a school play intended to celebrate Black History Month. Published by Scholastic Books, the play, “A Triangle of Trade,” written by Marci Applebaum and Jeff Catanese is meant to introduce students to the Columbian Exchange, the Trans-Atlantic Slave Trade, and the origins of plantation slavery. [vi] There are cell phones in the play—cell phones in the era of the slave trade. Yes, I know. But let’s overlook that for a moment. The phones are little more than a hack literary device to allow traders, heads of state and religious leaders to communicate in real time across the Atlantic Ocean. My son, one of only a couple of African Americans in the class, was cast in a double role, as both a captured African intended for sale and as a West African coastal chief eager to profit from the slave trade. Yes, I know. The Black kid plays the African. Twice. Obvious and predictable, but let’s overlook that for the moment as well. Once upon a time, in February, my son starred in a school play. Sometimes I hate Black History Month. Sometimes, I really do. [i] Manny Fernandez and Christine Hauser, “Texas Mother Teaches Textbook Company a Lesson on Accuracy,” New York Times, Oct. 5, 2015. [ii] Ellen Bresler Rockmore, “How Texas Teaches History,” New York Times, Oct. 21, 2015. [iii] Peter Wood, “What Were They Thinking,” Chronicle of Higher Education, July 6, 2012. [iv] Ron Charles, “Free Speech Groups Defend ‘A Birthday Cake for George Washington,’” Washington Post, Jan. 22, 2016; idem, “Scholastic Defends Its Free-Speech Credentials,” Washington Post, Jan. 25, 2016. [v] W. E. B. Du Bois, Black Reconstruction in America, 1860‒1880 (1935; New York, 1962), 728. [vi] Marci Applebaum and Jeff Catanese, “A Triangle of Trade,” in idem., Colonial America (New York, 2003), 25‒37. Jason R. Young is Associate Professor of History at the University of Michigan.